INFINITO. 46Ft Motor Launch. Launched 1986. Extensive upgrades completed by current owner. 3 Skin kauri glassed construction. 2 x Cummins 320HP diesel, shaft drives. Cruise 16-18 knots, max 23 knots approx. 1500 litre fuel capacity. 2 station steering (flybridge and main saloon). Bowthruster, full electronics package includes radar, GPS, Depth Sounders (2), Autopilot with remote. 4 channel Stereo system, 2 x TV. 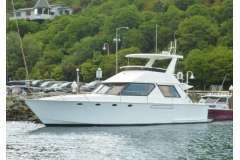 Accommodation includes 2 double cabins forward with shower, vacuflush toilet and holding tank. Cooks will enjoy the nice galley, positioned aft of saloon with oven, microwave and domestic type Fridge/Freezer. All cutlery, crockery and cookware is included. Infinito comes well equipped with dinghy, liferaft, electric anchoring system, game poles, game chair......and lots more. Chaffers Marina berth available to purchase or rent by negotiation.Price reduced!